We are running a few art projects in primary schools over the summer term. Since we started making wishing trees with schools about 10 years ago they have become increasingly popular. Most schools like to have them in a prominent place indoors where seasonal creations can be hung from the branches. For example decorated eggs at Easter, stars at Christmas. 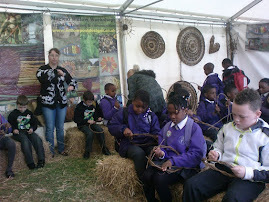 We work with small groups of children weaving the trees. We will be displaying 2 woven trees at the RHS Flower Show at Hampton Court this summer.